Beautiful Fall look. Love the sweater and the cool pants! Great layered look and cute sunnies. Great outfit! I love those pants. I also love how you layered the sweater over the blue/grey shirt, it looks fabulous! I love love love this entire outfit! that sweater is a perfect shade of red and I love how soft it is contrasted with the pants you’re wearing. absolutely gorgeous! Perfect casual chic look with a little bit of an edge! You look feminine and confident! Such a gorgeous look! I love that sweater and those Paige pants! Great photos! I love how this sweater breaks up the bold colors! Leather pants are my staple for fall and this look is perfect! Beautiful! Love the color of that top and love it with those pants! I really like this outfit. Those two tone pants are really cool and I love that sweater! i’m loving this layered look, perfect for fall. and of course the leather pants are always a win! Loving this whole look, and that sweater is genius! This is such a great look!! Love it all! That Clare V. bag makes every outfit amazing. I’m saving up for one – hopefully I’ll make it mine next month! I looove this red sweater! So charming and great! Loving the different texture’s all mixed together! 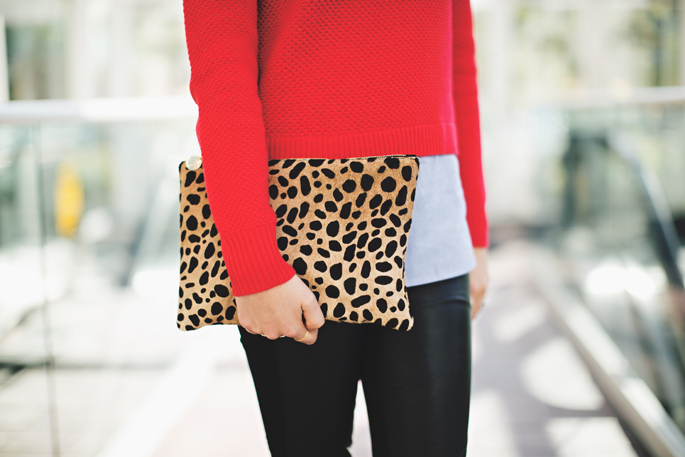 Loving the red and pop of leopard! Super cute! You know what I love; the way you continue to style the same outfits and accessories from your wardrobe over and over again in different ways. It’s realistic and makes for some very interesting combinations. Such a classy, classic and statement outfit! 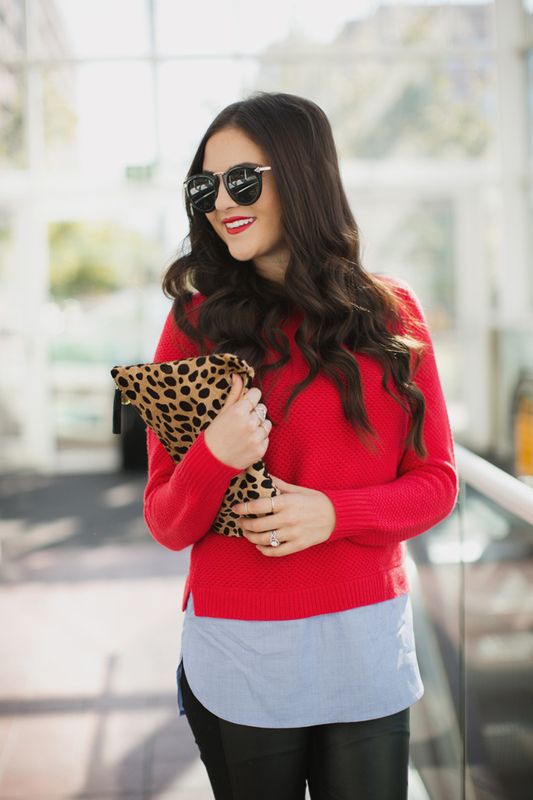 Love a classic red and leopard combo! And those pants are seriously amazing! Love that sweater! Have had my eye on it for a while now. Stunning outfit!!!!! Love the sweater with the leather leggings!!!!! In LOVE with this look! Love the leopard clutch with it! I am LOVE-VING those sweaters from J.Crew! So perfect to have a mixed medium and a little bit longer to wear with leggings or tighter pants! This is such a gorgeous look! LOVE this Rach! Amazing pictures. GORG as always! Loving your hair. Always looking amazing and super feminine! Perfect outfit! Love the layered look and you can’t go wrong with a leopard ‘pop’!! Great look! Love the color of the sweater! Love the pop of red! Perfect. Now this is a hot look!!! You look stunning in red and I love that you added a red lip as well. I love the blue and white version of this and debated the red, but after seeing this I definitely have to get it. You really styled this to perfection, from the leather to the leopard clutch. This is definitely one of my all time favorite looks! Love this layered fall look! You should definitely wear more red. Such a greta color on you! i am in love with this look and that j crew sweater is everything!! Those pants!!!!! Great casual yet slightly edgy look. 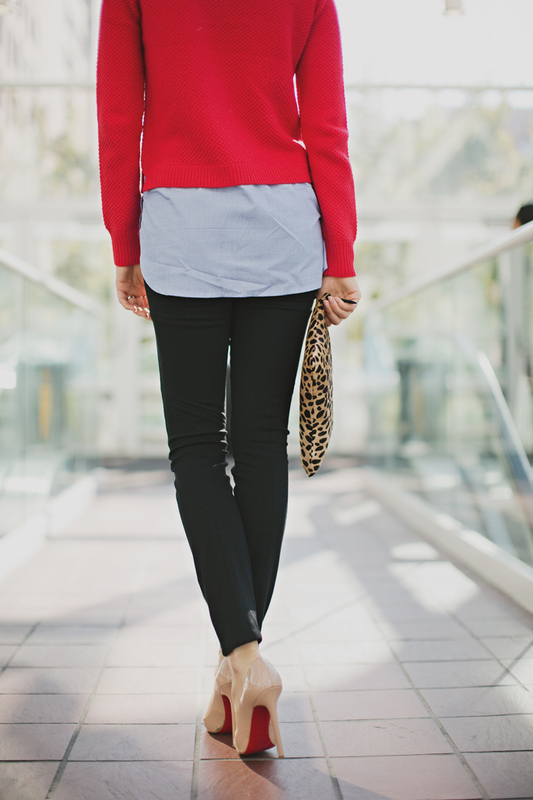 Love how the red soles compliment the red sweater! LOVE this look, the leather pants are my favorite! Love that crimson color you! Love this look! Very pretty and chic for fall! Gorgeous look and the sweater is fantastic! This look is killer! I just ordered a pair of leather leggings myself – I can’t wait for them to come in! Love that you paired them with a slouchy knit. Love the sweater! The color is so pretty. What size did you get? If you don’t mind me asking. Love the outfit Rach! Looks cool. You look fabulous! Love the bright red lippie! Such a timeless and stylish look! I love them!! Beautiful outfit. Love those pants and the heels! Your pumps are so pretty! I love a nice heel paired with some skinny jeans. This looks great, love the contrast of the red and the black. That red looks amazing on you!! This outfit is perfection!! I love the combo of the tight leather pants with a chunkier sweater! So chic! Stunning in Crimson!!! This simplistic look is so gorgeous due to the colours and the different textures. Your dark hair and red lip colour really plays a huge part on how beautiful this look truly is!!! I am just in love with this look. I think that you have thoroughly convinced me that I need some leather pants for this Fall. Okay it’s official – I am totally jealous of your shoes!!! I have that sweater in every color and print! They’re too perfect for fall and winter. I love everything about this outfit! Super cute! Really love this look! I need to purchase those shoes! That is the perfect colour of red! I love it paired with you leather pants! Gorgeous!! Crimson looks absolutely beautiful on you!!! 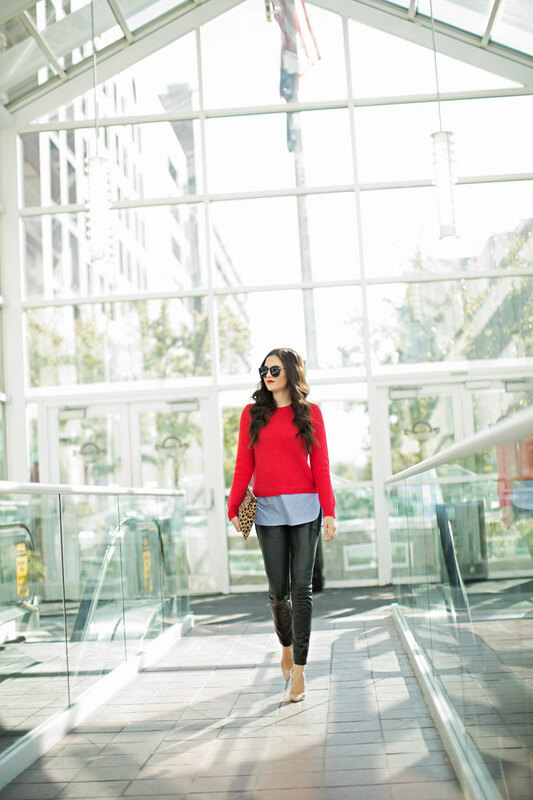 I love this sweater paired with the leather pants…perfect! Beautiful look, this kind of red is perfect! I love the venue, really showcases the red… makes the outfit pop! looking wonderful as always Rach! i love this outfit! That sweater looks perfect for fall and I’m obsessed with that clutch!! Red always looks so pretty on you Rachel! I love the layered pieces in this outfit! 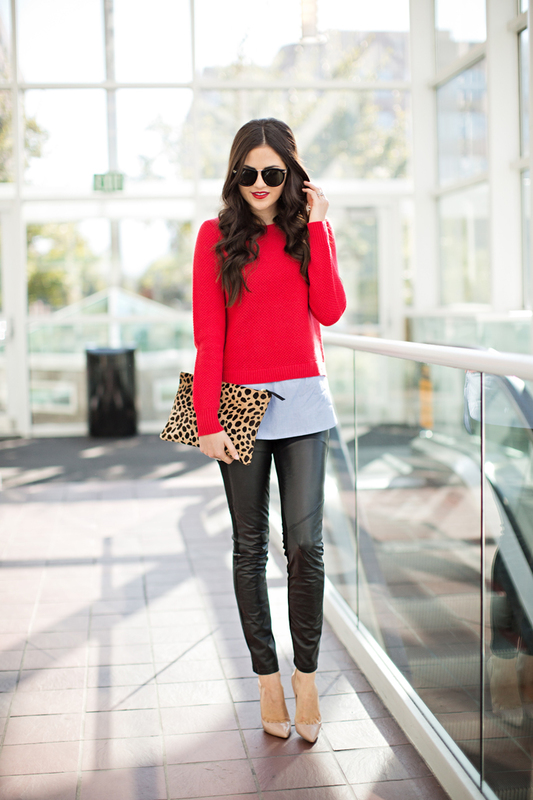 Such a gorgeous fall look, the red jumper and blue shirt look amazing together! Love those two toned jeans! Wow, I love this look! It’s perfect for autumn. Love this look! I have these leggings and wanted to know how you clean them? I sent them out once to have them cleaned and it cost me so much money that I don’t wear them very often because I am afraid of getting them dirty! Hey! Wow do I love your site. Can i ask who designed it? I just purchased a similar pant. Can I wear them with a suede bootie? Yes, for sure! I suede boots with my leather pants all the time! J Crew didn’t have my size in store. A few days later saw your post and immediately ordered online! Love the sweater paired with the leather leggings! Beautiful as always!